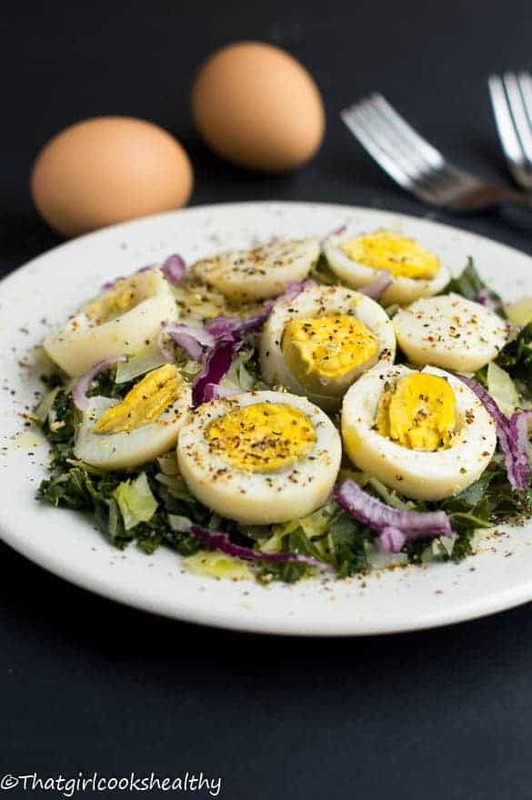 Boiled eggs with curly kale – Boiled eggs sitting on a bed of steamed kale, cabbage and garnished with red onion and seasoned with garlic pepper. You guys already know when it comes to breakfast and a light lunch I literally make a bee line for all things egg related. Well not exclusively but to the point where it undoubtedly comes to the forefront of my mind. When it comes to purchasing eggs I always ensure they’re British Lion Eggs, the quality of the egg is extremely important to me and with 90% being now produced to the British Lion standard I feel much more assured that I’m consuming eggs that are in accordance with the perimeters of health and safety provisions. Now with that self-reassuring psycho babble out of the way, let’s get down to business……….FOOD! Yup after all that’s what you guys are here for right? 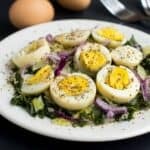 Well this recipe is an association with the British Lion eggs scheme I must put this disclaimer out, that this post is not sponsored nor affiliate marketing. I did not receive any financial subsides for submitting this recipe.**. When it comes to boiling an egg many people experience great difficulty, while others can master it with ease (without a timer). I supposed when you think about it, it’s almost the same as people who struggle to achieve a bowl of soft fluffy rice, isn’t it? 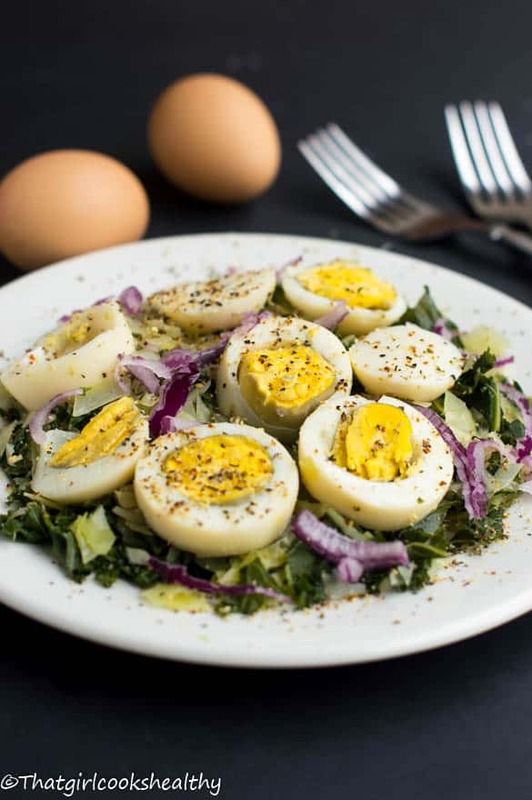 In theory how long to boil an egg is down the individual, for instance a soft runny egg should take approximately 3 minutes and a firm hard boiled egg should take roughly 6-7 minutes. 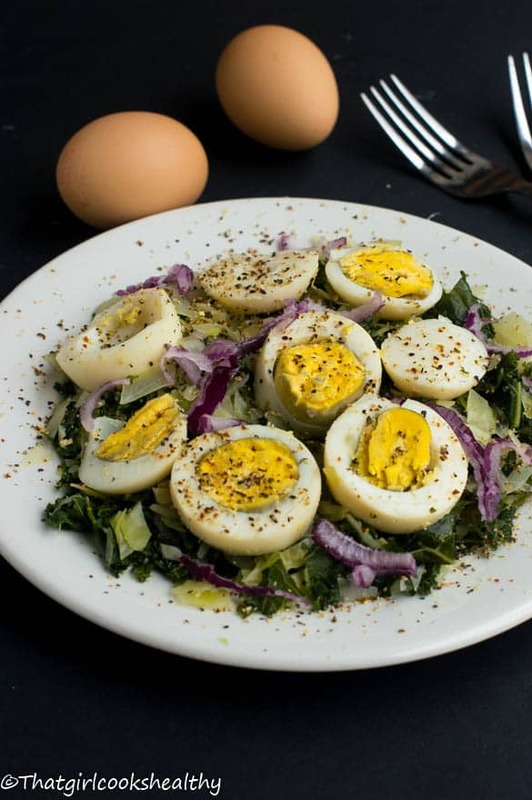 I prefer boiled eggs that are firm and overdone, as reflected in the pictures. 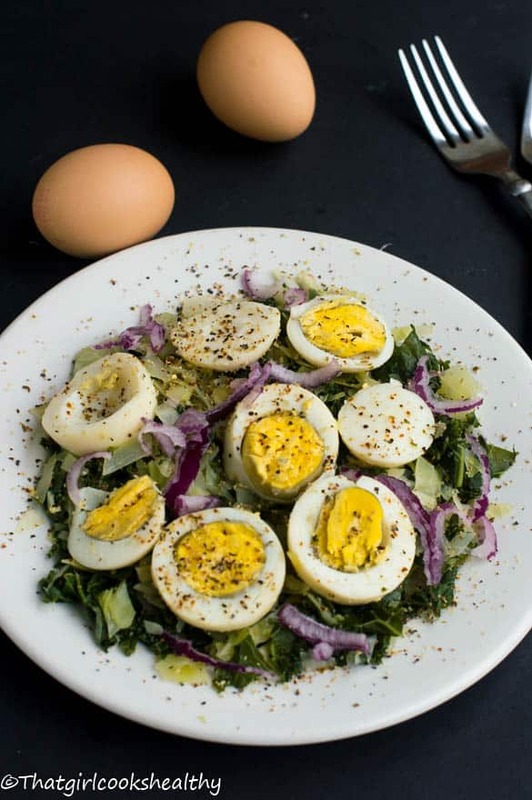 I pulled together a light hearted veggie egg recipe that’s no fuss, mildly seasoned and equally as filling thanks to the combination of steamed kale and cabbage. You can boil the eggs to your preference and tweak the recipe, otherwise follow my lead which took 6-7 minutes to achieve those results. Add the kale, cabbage, dairy free butter or coconut oil to a small pan 1/3 filled with water, bring to the boil then reduce the heat and cover with lid, steam the veggies 6-7 minutes or to your desire. The longer the veggies steam for the softer they become, so be mindful of that, don’t forget to drain off the excess water. At the same time in another small pan add the eggs with cold water, cover the eggs by an inch.Bring the water to the boil, set the timer accordingly your preferred timing or if using an electronic egg boiler follow the instructions. Once cooked allow to cool before removing the shell.